We strive to provide a nice resource for people wishing to bet on tennis legally. However, it would take an entire encyclopedia's worth of literature to fully explain the ins and outs of betting on tennis per match, per tennis betting odds, per prop, etc. We can give you a rough outline, but then it's your job to visit these sites and to research the different types of bets further. Unfortunately, no one's attention span would be long enough to read a novel about betting here. But that isn't to say we can't help further. We're more than willing to offer some solid tips you can use when betting on tennis. Now that you've got some new betting tips under your belt, our top recommendation for legal tennis betting is to visit BetOnline Sportsbook. 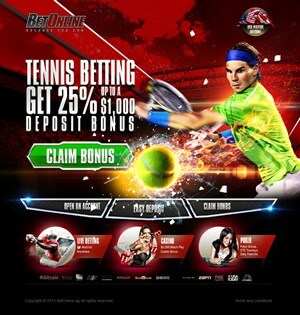 They welcome US players, deliver a strong selection of betting lines and wagering options, and have a killer 25% bonus that extends to every single deposit you make for the life of your account. Their mobile betting app is well designed and user friendly, and their live betting features are effective and sophisticated. Their customer support is stellar and we found their banking suite to support US players very well. The first tip we want to touch on is one we feel is the most important, and probably the simplest of the lot, thankfully. As discussed in a previous section, tennis betting can get a bit hinky with all the live tennis betting that includes in-play and live-time changes. And if it's like that for a single game, just imagine an entire tournament. So, say you're looking forward to Wimbledon and think that Serena Williams is in line to win yet another title. Your best bet, however, is to bet on her on a match-by-match basis, sizing up her opponents. This way, you can also leverage your bets by placing smaller bets on big favorites, while retaining your overall bets on Serena per match. It's a safer play than placing one larger wager to win, while many rounds have yet to play out. Amateur sports induce an awful lot of betting. Just look at NCAA men's basketball and men's football, and you will see betting that rivals the NFL and NBA. While collegiate tennis does have a following, it's much harder to keep up with on an amateur level. NCAA tennis is popular, but in terms of finding out information like stats, watching footage from past matches, etc, there isn't nearly as much material for amateurs as there is professionals. This is why you should stick with betting on the pros, at least until you get the hang of betting on tennis. When you pick out a player or two to follow around with your bets, how much do you actually know about them? Roger Federer, for instance, is considered one of the greatest players ever, but he struggles mightily on clay. Some players struggle when it's raining. Some struggle on that soft English ground at Wimbledon. And on and on it goes. This requires research, which might be a bummer, but by studying the conditions and how certain players perform during different conditions and on different surfaces, you can make much smarter bets. Another great way to leverage your bets and to reduce your risks is to stick with betting smaller amounts on favorites over a few matches. Think of it like horse betting. Sure, a 50:1 shot can make you a ton of money if it comes through, but that 5:3 shot is much more likely to win, and while the payday isn't as big, at least it's profit. The same applies for tennis. Sure, you might get sick of betting on Federer and/or Nadal because they don't pay off as much, but you also won't lose nearly as much. Tennis works in cycles more often than not, and rarely do underdogs actually crawl through the entire tournament and win. They might upset a player, but it's typically the top-ranked players who win the titles. By comparing odds and playing what's hot, you're cutting your risks back drastically. It may seem like it takes the "gamble" out of gambling, but if your aim is to win, then betting smart and betting small is truly your best bet.